Azumah Nelson, former World Boxing Council (WBC) Featherweight Champion will start a nation-wide inspirational youth training tour starting from the three Northern Regions in April this year. The nation-wide tour, which is to be under the auspices of the ex-champion's charity foundation, the Azumah Nelson Foundation will seek to explore and promote aspects of the champion and tell his extraordinary story to inspire the youth to bring out the best in them. Disclosing this to the GNA Sports in Accra, a spokesman of the Foundation said aside the main aim of the talent hunt, the message will be mixed with virtues like the fear of God, discipline, dedication and modesty unto the youth during interactions on the tour. Azumah, a boxing icon from the African continent was in June last year inducted into the International Boxing Hall of Fame in New York, bringing to an end one of the most illustrious careers in boxing. The Spokesman also said that the tour would mark the next stage in the life of the former champion, which is to be dedicated to public service, mainly directed to the youth of Ghana and Africa. It said that issues of HIV/AIDS will be included in the programme to enable the former champion use the opportunity to especially advise students of second cycle institutions of the dangers the disease. The Boxing "Professor' is expected visit over 30 second cycles schools at the end of his regional tours. The programme would include the making of a documentary film to tell the full story of Azumah's life from his childhood to his boxing exploits and the time that he was inducted into the Hall of Fame. 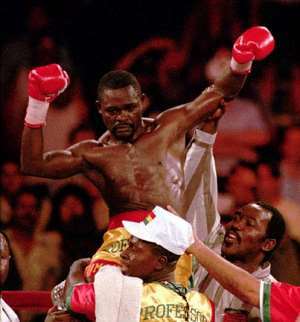 The programme will end with the celebration of Azumah's 20th anniversary of the first of his three world titles. The celebration to be dubbed "the Ultimate Hurray" will be timed to coincide with the December 8 date when Azumah beat Wilfredo Gomez in San Juan, Puerto Rico to win the WBC Featherweight title. The other world titles' won by Azumah were in 1988 and 1995. Other activities planned for the "Ultimate Hurray" celebrations are a pilgrimage to Bukom accompanied with a brass band music, boxing clinics with lectures and tutorials, an exhibition of Azumah's boxing memorabilia and dinner with guests like Jeff Fenech and Marvin Hagler among others.